Warm up Your Winter with Curry! On a cold winter evening, there is nothing so inundated with warmth and flavor as a good curry. And homemade curry can taste even better than restaurant curries with one of the following delectable recipes. These dishes are authentic and straightforward to make. Once you've learned how to make a good curry, you won't forget, and your curry-making skills will only get better. Whatever type of curry you choose to try, be prepared for dancing taste-buds and rave reviews from your family and friends! This Thai Green Curry Chicken recipe features chunks of tender chicken simmered in a homemade green curry sauce along with your choice of vegetables. 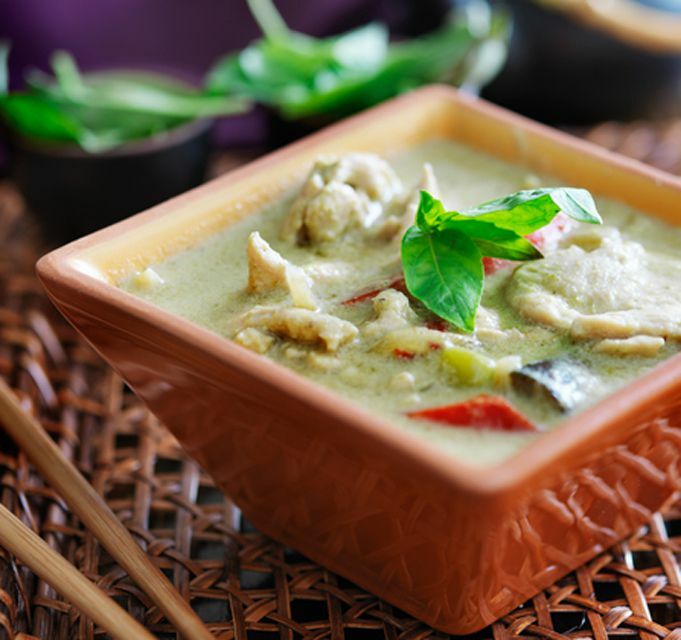 The result is a gourmet-style Thai green curry that is very aromatic and beautiful to serve, and great for entertaining! A golden-hued Thai chicken curry simmered with individual spices, fresh herbs, and a hint of cinnamon. A swirl of coconut milk is added at the end which adds a rich, creamy texture for the ultimate Thai taste. In Thailand, yellow curries are made with yellow chilies, but red can also be substituted. For those whose taste tend towards milder foods, this curry is also delicious made without chili, which makes it perfect for the whole family. This Thai Red Curry Recipe is fragrant and sumptuous, and can be made anywhere from mild to red-hot, depending on your taste. It starts with a homemade Thai red curry paste which is simple to make. Add coconut milk, chicken, and some vegetables, pop it in the oven, and you have a healthy and hearty curry dish that will awaken your senses and boost your mood. Thai Beef Curry - Best Ever! A sumptuous and authentic Thai beef curry that warms and delights the palate. Especially welcome during the fall and winter months, this hearty red curry features deep flavors and a rich finish completed with fresh basil leaves and freshly-ground black pepper. Serve it with Thai jasmine-scented rice for a feast of a dinner any night of the week! This Vegetarian Thai Yellow Curry is authentic, homemade vegan Thai food at its best. Unlike a lot of other yellow curry recipes out there, this recipe does not call for curry powder; instead individual spices are used for a superior-tasting curry. Serve with your choice of plain jasmine rice, coconut, or whole grain Thai coconut rice for a delicious, healthy, and nutritious vegan dinner. This authentic Thai Panang curry (also spelled 'Penang' like the northern Malaysian state) carries with it flavors and aromas of distant places - you'll find references to Malaysia, India, and Burma. With its homemade combination of spices and fresh herbs, this Panang Curry Chicken is super delicious and easily made from scratch. Enjoy this sumptuous homemade Thai recipe, direct from my kitchen to yours! For anyone who loves Thai flavors, this curry recipe is a must-try! Made with lime leaves and fresh-squeezed lime juice, the curry paste is extremely aromatic and flavorful. The prominent flavor of the lime leaves distinguishes it from other curries and gives it outstanding taste. Serve this to your guests and wow them with your Thai cooking finesse! Planning to have friends over? Serve them this special curry and you'll have friends for life! The curry sauce is so delicious, yet easy to make. The secret ingredient in this curry is a hint of tomato in an otherwise basic yellow curry, which marries beautifully with shrimp. Also contributing to this sumptuous curry are pineapple chunks (fresh or canned) plus coconut milk and dry toasted coconut for a tropical-tasting Thai curry you'll want to make again and again. Thai Massaman Lamb Curry is a sumptuous dish that's rich in both flavor and nutrients. The curry sauce is made from scratch for the best flavor and freshness. The ingredients list may seem long, but it is quite easy to make - you don't even need a food processor. Just toss all sauce ingredients into the curry pot as you prepare them, and simmer together with the meat. Try this homemade Thai massaman curry recipe, which is made entirely from scratch (no packaged curry pastes required!). This famous Thai curry is rich and very flavorful. It is muslim in origin and can be made with chicken, beef, or lamb. It's a fragrant yellow curry that incorporates lemongrass and nuts together with other key Thai ingredients. For special occasions, serve with saffron rice or coconut rice. This vegetarian curry offers an array of bright colors - orange, yellow, and red - infused with citrus accents. You'll love the delicious taste of this curry, as well as its healthy combination of vegetables, including pumpkin or squash, yam/sweet potato, carrots, yellow bell pepper, and cherry tomatoes. Add chick peas as a protein source, then finish the dish with a sprinkling of pumpkin seeds for a gourmet Thai dish everyone will love. Thai Mixed Seafood Curry - Sumptuous! If you enjoy seafood, you'll love this sumptuous curry. The recipe starts with a healthy homemade, rather tart curry sauce that marries beautifully with fish & seafood. The sauce is heated in a wok or deep frying pan, to which an assortment of seafood and nutritious vegetables are added, plus chunks of pineapple which marries beautifully with the seafood.